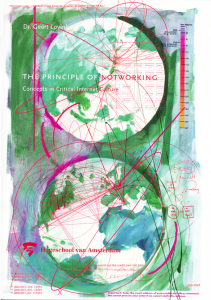 On February 24, 2005 Geert Lovink delivered his inaugural lecture as lector of the Institute of Networkcultures, part of the University of Applied Science of Amsterdam. The full text of the lecture can be found here: Geert Lovink – The Principles of Notworking. In this essay he presents ongoing theoretical work, developed throughout 2004, the year he took up the position of ‘lector’ at the Hogeschool van Amsterdam. He focuses on three conceptual fields: the relation between multitude, network and culture, the art of collaboration and ‘free cooperation’, and finally presents elements of a theory of ‘organized networks’.